At B. Franklin Jewelers we strive to deliver unparalleled service while offering an exceptional selection of fine designer jewelry and exquisite gemstones. We realize the importance of earning your trust and we are committed to maintaining the highest levels of professionalism and integrity throughout all our dealings. We wish to exceed our clients' expectations in the areas of selection and value in our goods and services. 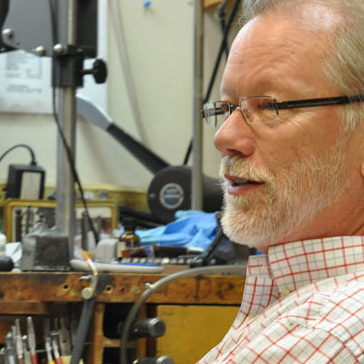 Brad Mathews; Owner and Master Goldsmith for over 35 years. B. Franklin is here to help you keep your precious jewelry in top condition. Brad, an owner, is a highly skilled jeweler who can accommodate many requests from a simple jewelry repair to custom design services. All jewelry services are done on premises at our store. We strive to keep our customers worry free, by taking the steps to insure our customer's precious items they leave with us are safe and not tapered with. Using a micro-scope with a video camera attached, we have the capability to show you the "finger prints" or inclusions unique to your diamond, gem stones and jewelry to reassure your confidence in us at drop off and pick up, upon request. Jewelry checking, cleaning, refinishing and revitalization. Patrica Mathews; Owner, Graduate Gemologist and appraiser. Patricia, an owner, offers appraisals by appointment on premise. From priceless heirlooms to exotic one-of-a-kind pieces, Patricia will help you protect your investment with accredited and accurate jewelry appraisals for your jewelry valuation and insurance needs. Whether you need an appraisal for insurance purposes, need help with the valuation of an estate or want to determine the true value of your jewelry Patricia will make the process simple for you. We are happy to furnish you an "Insurance Replacement Estimate" upon your request for all items purchased in our store. Due to fluctuating market conditions, we strongly advise that you have your documents updated every 2-3 years. We Buy Gold, Sell to Us! Jewelry is not meant to sit in a drawer or safe! B. Franklin Jewelers discreetly purchases gold, diamonds, gemstones, gently worn branded jewelry, fine estate and vintage jewelry. This provides an opportunity to sell your older, unwanted gold pieces – either outright or as a down payment for new jewelry you'll want wear and love! We offer fair market price for gold, platinum, diamond and gemstone jewelry. Keep in mind items that are weighed for gold value it is taken into account the purity of the metal. The value of your gold is proportional to its purity. In other words, since 14k gold is 58.33% of 24K gold it would be 58.33% of the price of pure 24k gold. Keep in mind that no buyer of gold is able to offer a purchase price to the equivalent of the market price of gold due to expenses incurred in the refining process.